Have you ever wondered about the trees you see when out in the forest, or how those trees are managed? If you want the answer, then look no further. Silviculture is the art and science of controlling the establishment, growth, composition, health and quality of forests and woodlands to meet diverse needs and values of landowners and society on a sustainable basis. A silviculturist is a person who practices the art and science of silviculture. A silviculturist is responsible for silvicultural examinations, reforestation, tree stand improvement, and prescribing the treatment for a timber sale. Silvicultural exams include the gathering of base data which follow national standards. A silviculturist writes a prescription that describes management activities needed to implement a silvicultural treatment or sequence. There are a number of silvicultural systems or methods designed to tend, harvest or re-establish a stand. These methods create even-aged or uneven-aged stands. There are also a variety of thinning methods, including thinning from below or above and thinning across a diameter range. Sometimes a particular silvicultural method is chosen to improve the health or the growth characteristics of the stand or because it is considered the best way to regenerate a stand. Other times, a method is chosen to enhance stand characteristics for wildlife or other resources. On the Sacramento Ranger District, the treatments in the stands for commercial harvest vary. Uneven-aged methods are utilized for both commercial and precommercial treatments, particularly in the ponderosa pine, to create and enhance habitat for northern goshawk and other wildlife species. Other treatments include group selection with reserves in the piñon-juniper areas for wildlife habitat enhancement projects. When out enjoying the Sacramento Ranger District, the major conifer tree species you will encounter include ponderosa pine, Douglas-fir, white fir, Engelmann spruce, southwestern white pine, piñon pine, alligator juniper, and one-seed juniper. Hardwood trees include gambel oak, Rocky Mountain maple, and quaking aspen. 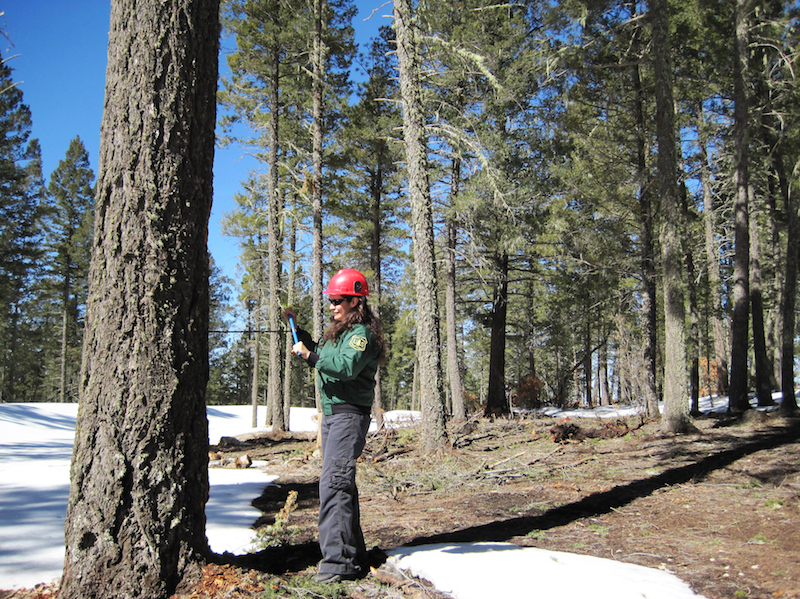 Want a career as a silviculturist in the US Forest Service? To become a certified silviculturist for the US Forest Service, a person must have experience in silviculture or a degree in the field. There is a national silviculture certification program which includes a number of training modules, including a module which concentrates on the part of the country where the trainee is currently working. After completing the training modules, the trainee completes a prescription for a stand or multiple stands, which is then evaluated by a panel. The panel is usually comprised of a university professor, current silviculturist(s) who works for the US Forest Service, o˛ther resource specialists, such as a soil scientist or wildlife biologist, and a line officer. 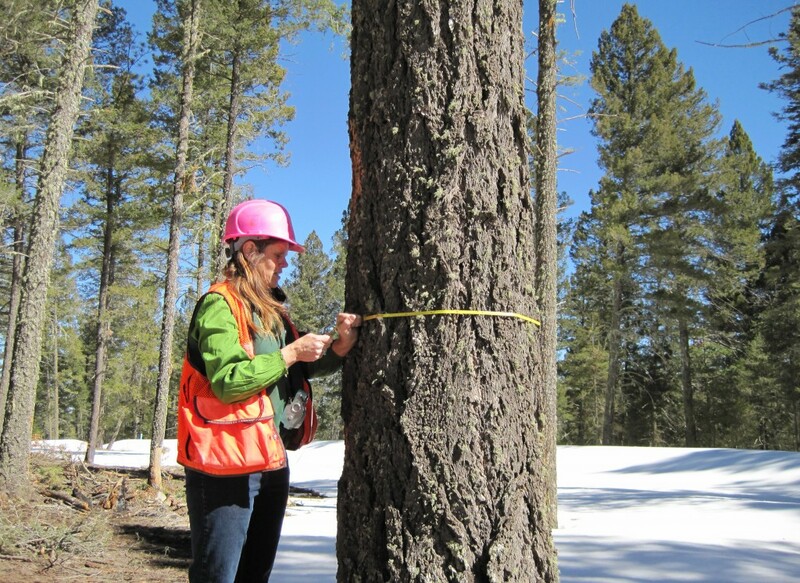 A silviculturist with the Forest Service must become recertified every four years. The US Forest Service requires that all forest vegetation management treatments on National Forest land have a treatment prescription signed by a certified silviculturist. A diameter tape is used to measure the diameter at breast height (DBH) of a tree. It is divided into inches and tenths of inches. It is calibrated so that when you actually measure the circumference of the tree, the measurement you read on the tape is the diameter. An increment borer is used to determine the age of the tree. You bore the tree to the pith (center), then extract the core and count the growth rings. A clinometer can be used for several things such as measuring slopes, tree height, and vertical angles. A logger’s tape is mainly used to take a tree’s height or measure a fixed plot (1/50, 1/100, 1/10 of an acre, etc.). A Relaskop® is a multiple purpose tool used to determine tree heights, measure a variable plot, or determine whether a tree is “in or out” of the variable plot. A prism is used during cruising timber to help determine tree spacing and which trees should be measured when sampling is being used. This article originally appeared in the April 2012 print version of the Mountain Monthly.